Listed here are a number of Highline’s administrators, full-time faculty, and staff. More than 1,200 talented and dedicated people serve students at multiple locations throughout King County, but because of space limitations, we’re not able to list them all. Those who are listed, however, are those who you are most likely to come in contact with. They’re here to help you make the most out of your Highline experience. President: BA, Saint Mary’s College; MA, University of the Pacific; PhD, University of San Diego. English: BA, College of Wooster; MA and PhD, University of Washington. Business Technology: BA and MBA, University of Washington. Physical Education: BS and MS, University of Illinois. Mathematics: BA, The Evergreen State College; MS, Western Washington University. History: BA and MA, University of New Mexico; PhD, University of Washington. Business Information Technology: BS, Strayer University; MS, American Intercontinental University. Counseling: AA, Merritt College; BA, John F. Kennedy University; MEd, Seattle University. English: BA and MA, Xinjiang University; MA, University of Washington. Philosophy: BA, University of Maine; PhD, University of Hawaii. Geology: BA, Carleton College; PhD, University of California, Santa Barbara. Biology, Botany: BS, Cal Poly; MS, Pennsylvania State University; ABD, Oregon State University. Psychology: BA, University of Washington; MA, California State University, Fresno; PhD, Peabody/Vanderbilt University. English: BA, Western Washington University; MA, University of Vaxjo, Sweden; MA, Western Washington University. Chemistry: BS, University of Utah; MS, University of North Carolina-Chapel Hill. Healthcare Professions: AAS, Wenatchee Valley College; AA, Yakima Valley Community College. Communication Studies: BS and MA, University of Nevada Las Vegas. Sociology: BS, Frostburg State University; MA & PhD, Loyola University. Physical Education: BS, Florida State University; MS, University of Florida. Reference Librarian: BA, Hofstra University; MLS, University of Washington. Mathematics: BS, The Evergreen State College; MS, Western Washington University; PhD, University of Michigan. Nursing: AS, Highline Community College; BSN and MSN, University of Washington. Business: AA, Seattle Central Community College; BA, University of Washington; MBA, City University; DBA, University of Sarasota. Business Information Technology: BA and MBA, University of Washington. Business: BA and MBA, Washington State University. Business: BS, Florida State University; MIM, Thunderbird-American Graduate School of International Management. Paralegal, Men’s Basketball Coach: BA, Seattle University; JD, University of Washington. Human Services: BA and MEd, University of Cincinnati. Ceramics: BFA, Minnesota State University; MFA, Washington State University. Physical Education/Athletic Director: BS, Washington State University; MEd, City University. Mathematics: AA, Saddleback College; BA, University of California, Berkeley; MS, California State Polytechnic University. Reference Librarian: BS, The Evergreen State College; MLS, University of Washington. Psychology: BA, Indiana University of Pennsylvania; MA, University of Kansas. Psychology: BA, Linfield College; MA, Antioch University. Business: BA & MBA, Augusta State University. Adult Basic Education: BA, University of Victoria; MA, Penn State University. Biology: BS and MA, Humboldt State University. Biology: BS, University of California - Davis; MS and MAT, University of California - Irvine; PhD, University of California - Davis. Spanish: AA, Highline Community College; BA, MA and ABD, University of Washington. Art: Certificate of Fine Arts, The Pennsylvania Academy of the Arts; MA, Antioch University. Accounting: BA, The Evergreen State College; BFA, School of the Art Institute of Chicago; MBA, California State University, Hayward. Physics: BS, MS and PhD, University of California, Los Angeles. Political Science: BA, University of Washington; MA, University of Victoria; PhD, University of Washington. English: BA, The Evergreen State College; MFA, Emerson College. Accounting: BS, United States Military Academy; MA, Washington State University. Reference Librarian: BS, Old Dominion University; MS, University of North Carolina. English: BA and MFA, University of Washington. Interior Design: AAA, The Art Institute of Seattle. Mathematics: BS, St. Rita College, Philippines; MS, Centro Escolar University, Philippines. Sociology: BA and MA, Xian Foreign Language Institute, China; MA, Brigham Young University; PhD, University of Akron. Nursing: BSN, Wright State University; MSN, University of Cincinnati. Healthcare Professions: BA, George Washington University; MPH, University of North Carolina. Geography: BA, Carleton College; MA, University of Chicago; PhD, University of California. Respiratory Care: AAS, Highline Community College; BA, Wayo Women’s University; MA, California Lutheran University. Computer Information Systems, Computer Science: BSc, Birmingham Polytechnic; MSc, University of Central England. English/American Ethnic Literature: BA, University of California; MA, University of Chicago; PhD, University of Minnesota. ABE/ESL: AA, Highline Community College; BAE, Pacific Lutheran University; MEd, University of Washington. ABE/ESL: BA & BA, University of Washington; MA, SIT Graduate School. Counseling: BS, Washington State University; MA and PhD, Southern Illinois University at Carbondale. Mathematics: AA, Green River Community College; BS, Pacific Lutheran University; MA, University of Washington. English: BA, Virginia Tech University; MA, University of Wisconsin. Criminal Justice: AA & AAS, Highline College; MS, Central Washington University; PhD, Capella University. Mathematics: BS, Walla Walla College; MS, Washington State University. American Ethnic Studies: BA, University of California - Davis; MA, San Jose University; PhD, University of Utah. Healthcare Professions: BA, DeVry University. English as a Second Language: BA, Ain-Shams University, Cairo, Egypt; MA, The American University, Cairo; MS and PhD, Georgetown University. Psychology: MA, San Francisco State University; PhD, University of Washington. Communication Studies: MA, University of Washington. Respiratory Care: BS, David Lipscomb University; Advanced Practitioner Certificate & Technical Certificate in Respiratory Care, Volunteer State University; EdS & MEd, Tennessee State University. English/American Multicultural Literature: BA, Drake University; MA, Iowa State University; MFA, University of Washington. ESL: BA, University of Washington; MA, Seattle University. Education: BA, Western Washington University; MA, Pacific Oaks College NW. American History: AA, College of Southern Idaho; BA and MA, Pepperdine University; PhD, University of Washington. English: BA, St. John’s College; MA & PhD, University of Washington. Mathematics: BS and MEd, Stanford University; MS and PhD, University of Idaho. ABE/ESL: BS, University of Illinois; MEd, Seattle University. Sociology: BA and MA, University of Nevada Reno; MEd, University of Washington. Chemistry: BS, University of California Los Angeles; PhD, University of California Riverside. Reference Librarian: BA, Linfield College; MFA, Eastern Washington University; MLIS, University of Washington. Biology: BA, Vassar College; MS, Oregon State University. Nursing: BSN, Seattle Pacific University; MSN, University of Phoenix. Accounting: BA and MA, University of Washington; DBA, University of Phoenix. Mathematics: BS, Vanlang University; BS, Vietnam National University; MS, Washington State University. Chemistry: BS, University of San Francisco; MA and PhD, University of California, Santa Barbara. Computer Information Systems/Computer Science: BS, University of Sargodha; MS, Fatimah Hinnah Women University. English: BA & MA, California State University Bakersfield. Respiratory Care: AAS, Highline Community College; BA, Addis Ababa University; MA, Canisius College. Music: BA, San Francisco State University; MA and PhD, University of Washington. Human Services: BA, York University; Certificate in Legal & Corporate Administration, Seneca College; MPA, Seattle University. Physical Education: BSE and MSE, University of Kansas. Engineering: BS, Huazhong University of Science and Technology; MS and PhD, University of Alabama. Economics: BSFS, Georgetown University; MS and PhD, University of California, Davis. Computer Information Systems, Computer Science: BS, Massachusetts Institute of Technology; MBA, University of Phoenix; PhD, University of Alaska Fairbanks. Reading: BAE, Wayne State College; MEd, University of Washington. Multimedia Design: BA, Eastern Washington University. ABE/GED: AA, Shoreline Community College; BA, Spanish, Western Washington University; MA, Latin American Literature. Mathematics: BS and MS, California State Polytechnic University. English: BA, University of Massachusetts; MEd, Harvard University; MFA, University of Oregon. Mathematics: BS, University of Puget Sound; PhD, University of Washington. Business: BA, San Diego State University; MS, University of Nevada, Reno; PhD, University of Washington. Philosophy: BA, University of Waterloo; PhD, Bowling Green State University. English: BAE and MA, Eastern Washington University. Mathematics: BS, University of Wisconsin, Madison; MS, University of Washington. Journalism, Political Science: AA, Highline Community College; BA, Western Washington University; MPA, The Evergreen State College; PhD, University of Washington. Biology, Oceanography: BS and MS, Stanford University. Adult Basic Education/English as a Second Language: BA, Shanghai Foreign Language Institute; MA and EdD, University of Washington. Biology: BS, University of California - Berkeley; MEd, University of Washington; PhD, Stanford University. Nursing: AA, Highline Community College; BS and PhD, University of Washington. English: BA, Himachal University; MA, Panjab University; MA, University of Washington. Anthropology: BA, Rutgers University; MA and PhD, Washington State University. English: AA, Highline College; BA, The Evergreen State College; MA, The New School. Economics: AS, Weber State University; BS, University of Utah; MA, Columbia University; ABD, University of Utah. Biology: BS and MS, University of Wyoming. ABE/ESL: BA, Tufts University; MEd, Seattle University. English: BA, Jiangxi University; MA, University of Lancaster; MA, Bowling Green State University. ESL: BA, Miami University; MA, Bowling Green State University. Music: BA, Swarthmore College; MM, University of Michigan; DMA, University of Washington. Nursing: AAS, Highline Community College; BSN, University of Washington, Tacoma; MSN, Seattle Pacific University. Accounting: BA, Montana State University; MPAcc, University of Washington. Personal Fitness Traniner: BA, University of Tampa; MS, AT Still University. English: BA, Kent State University; MA and MA, Missouri State University; MA, University of Washington. Spanish: BA, University of Texas at El Paso; PhD, University of California at Irvine. Mathematics: BA, University of Oregon; MS, University of Virginia. Mathematics: BA, California State University, Stanislaus; MA, California State University, Fresno. Business Information Technology: BA, Washington State University; MA, University of Phoenix. Paralegal: BA, Samford University; JD, California Western. Education: BS, Ohio State University; MA, Pacific Oaks College NW. Geology: BS, Indiana Purdue University; MS, Indiana University. Counseling: MSW, Seattle University; BA, Pacific Lutheran University. Communication Studies: BA & MS, Washington State University. Computer Information Systems: AA, Highline Community College; BA, Seattle University; MS, City University. Dean, Extended Learning: BA, Dickinson College; MEd, Antioch University. Director, Financial Aid & Student Employment: BA, Seattle University. 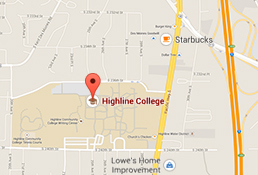 Director, Financial Services: AA, Highline Community College; BA & MA, Central Washington University. Vice President of Student Services: BA, University of the Pacific; MA, California State University, Stanislaus. Program Manager, Institutional Research: BA, University of Washington. Associate Director, Information Technology Services and DCIO: BAS, Central Washington University. Executive Assistant, Vice President for Academic Affairs: AA, Green River Community College. Executive Assistant, Student Services: AA, Spokane Falls Community College. Director, Puget Sound Welcome Back Center & ESL Special Projects: BA, Pacific Lutheran University; MA, Luther-Northwestern Seminary. Analyst/Executive Assistant: BA, California State University - San Marcos; MS, University of Maryland - University College. Director, Facilities: BS, Washington State University; MA, University of Washington. Director, Admissions: BA, University of Oregon; MA, Gonzaga University. Director, Instructional Design: BS & MS, Cornell University. Director, Transfer Center: BA, Goucher College; MA, University of Illinois, Urbana. Dean of Instructional Resources: BA, Western Washington University; MLS & MPA, University of Washington. Dean of Instruction for Professional Technical Education: BS and MEd, University of Cincinnati. Director, Public Safety & Emergency Management: BS, DeVry University. Director, Community Engagement: BA, University of Puget Sound; MA, The Evergreen State College. Associate Dean & Registrar, Enrollment Services: BA, University of Washington Tacoma. Vice President for Administration: BS, Central Washington University; MBA, City University. Director, Media Services and Library Networks: AAS, Grays Harbor College. Director, Women’s Programs: MPA, The Evergreen State College. Director, TRiO Student Support & Retention Services: BA, Oregon State University; MEd, University of Washington. Director, Access Services/ACHIEVE: AA, Highline Community College; BA, University of Washington; MEd, Seattle University. Director, Advising & High School Programs: BA, University of Texas at Austin; MPA, University of Washington. Executive Assistant, Vice President of Institutional Advancement: AAS, Highline Community College. Director, Center for Leadership & Engagement: BA, California State University - Chico; MEd, University of Vermont. Director, Library: MLS, Emporia State University. Vice President for Academic Affairs: BA and MA, Eastern Washington University; EdD, University of Washington Tacoma. Director, Academic Assessment & Placement: BA, Western Washington University; MEd, Seattle University. Director, Adult Basic Education: BA, University of Oregon; ME, Western Washington University. Executive Director, Information Technology Services: BME, Pacific Lutheran University; MEd, University of Washington.